Don’t take it personally but do draw a boundary. This summer I’ve been working with a cohort to align our curricula with other districts near us. It’s been tough but also rewarding work. I feel like we’re really working to help our district’s students get the same education as others so they can be ready for college. Our district sent a team of two people to these meetings, me and another principal. I am the principal of a large, high-achieving middle school, and the other principal leads a smaller Title I middle school. I share these facts because the other principal never stops talking about how nobody cares about her school. She’s the most negative education colleague I’ve ever met. She’s constantly raising her hand during the cohort meetings to tell people why she can’t do what they do because she doesn’t have the resources or the “smart” kids. She really says that! Is there any way to ask her to reconsider how she talks about her school and student body? Should I talk to our superintendent about this? I hate that she’s out in the community bad-mouthing our district. Have you ever heard the one about the things we cannot change? We have to accept them. However, if you really believe that having a conversation with your colleague will help her see how inappropriate you feel her behavior is, then I think you’ll need to be gentle. Approach her with an attempt to understand her point of view. She’s running a different building with different resources, and her own experiences with your district may be very different from yours. 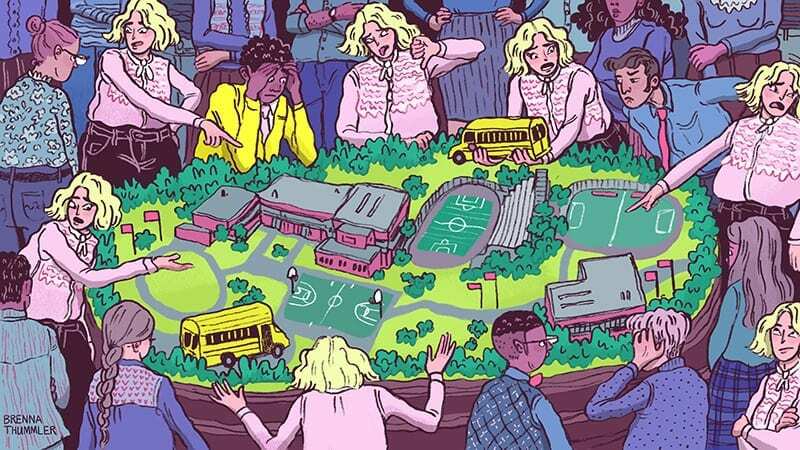 Some districts and many state programs reward high-performing buildings with more freedom and extra resources—a Title I school is, by definition, one which needs extra academic support to reach the same benchmarks. No one brags about a struggling building in a poor neighborhood. This can create the illusion (or reflect the reality) that no one cares, which can create a negative teacher or administrator. What I’m saying is, ask her about her experiences before you get her boss involved. If she first feels heard, it’s more likely she’ll listen when you explain your concerns about the way she’s portraying your district. Perhaps you can explain that, even when things are dysfunctional, there are ways to frame questions without saying the place where you work is an awful land of uncaring people. That said, there’s also the issue of respect for her most vulnerable students. Some people in our profession have a hard time remembering that children with parents who have to work two jobs, who have too-little food, who have old clothes that don’t fit, or who have parents that are too busy for bath time are not less intelligent. Some people are willfully unaware of these truths and the impact they have on a child’s education. I’m not sure anything you say will rectify this line of thinking. You may, during your conversation, be able to demonstrate how it sounds to others when she talks about her students this way, but her thoughts and beliefs are not anything you can control. If she takes any of your advice, that’s wonderful. If she’s slandering your district, then yes, talk to your superintendent after the conference. One thing to consider is, what type of person is your superintendent? Will your concerns be heard in a way that is meaningful? Will appropriate actions follow your conversation? The other administrators in your meetings work in your profession; they’re familiar with colleagues who live in the darkest of places. Ultimately, her actions and her words are her responsibility, and they may find their way to your superiors without you. Take whatever action you feel is necessary but know that you are involving yourself in her career. That can create a different problem. Don’t let that stop you but prepare yourself for the possibility. I’m going to leave you with the words I give to my students: You worry about you; you can’t control anyone else. Each week, our brave school leadership expert answers your toughest questions about the daily adventures and challenges we all face as we strive to make our schools great places for kids to learn. Have a question? Email it to principalhotline@schoolleadersnow.com. Plus, check out When Principals Don’t Trust Their Teachers.